Diamond engagement rings will always be an essential element of the bridal style, but today, people are considering modern adaptations on this jewelry tradition. When it comes to custom jewelry creation, there is no shortage of ways to craft a one-of-a-kind, non-traditional engagement ring. Diamonds may be exquisite and beautiful, but they are by no means the only way to create an incredible engagement ring. Interestingly, diamonds have not always been the defining feature of engagement rings. During the early 1900s, diamonds were only one of the many popular gem options, others being semi-precious stones ¾ sapphires, emeralds, rubies. If a couple did decide to purchase a diamond ring as a symbol of their marital commitment, they typically chose small, budget-friendly stones. Everything changed in 1938 when the De Beers jewelry company debuted a massive advertising campaign that sought to make the diamond a patent symbol of marriage. Their efforts were incredibly successful, cementing diamond engagement rings in the people’s minds around the world as the ‘gem of true love’―until now. If you are looking for ideas for engagement rings that don’t involve diamonds, there are virtually no limits to how creative you can be. Here are a selection of ideas for one-of-a-kind, diamond-free rings. There is no doubting the pure beauty of a pristine sapphire. Did you know that Princess Diana herself chose the iconic sapphire specifically for her royal engagement ring? She had a keen eye for style and the deep blue elegance of the sapphire spoke to her. Sapphires come in an array of beautiful colors, ranging from the well-known rich blue, to a vibrant yellow, to a rosey, seductive pink. Because sapphires are extremely durable, they are an ideal, non-diamond choice that can stand up to the everyday wear of an engagement ring. You can choose a large, single sapphire in a solitaire-style setting or cluster several smaller stones together like Princess Diana’s for an eye-catching look, mixing and matching gem colors and shapes for a sophisticated and colorful ring. Red has long been associated with passion and love. Images of deep red roses, red hearts, and glamorous red dresses are established symbols of love and attraction in our culture. As such, it makes sense that rubies are a perfect option for non-diamond engagement rings. Like sapphires, rubies are incredibly durable and have been chosen by many celebrities as a diamond alternative. Consider setting a gorgeously cut ruby in a pure yellow gold setting to complement the warmth of its deep shade of red or accenting it with diamonds for extra sparkle. While quartz may not strike you as engagement ring material, it is becoming increasingly popular as a gem option for brides and grooms. Quartz in the form of amethysts or citrine is common, but the latest style to garner attention is rutilated or tourmalinated quartz. This type of clear quartz features the natural inclusions, appearing as swirls or flecks in a variety of colors. It is an extremely unique look, best displayed as a solitaire setting where it can take center stage. No matter what style of engagement ring you are searching for, Dominion Jewelers can help you find the perfect match. 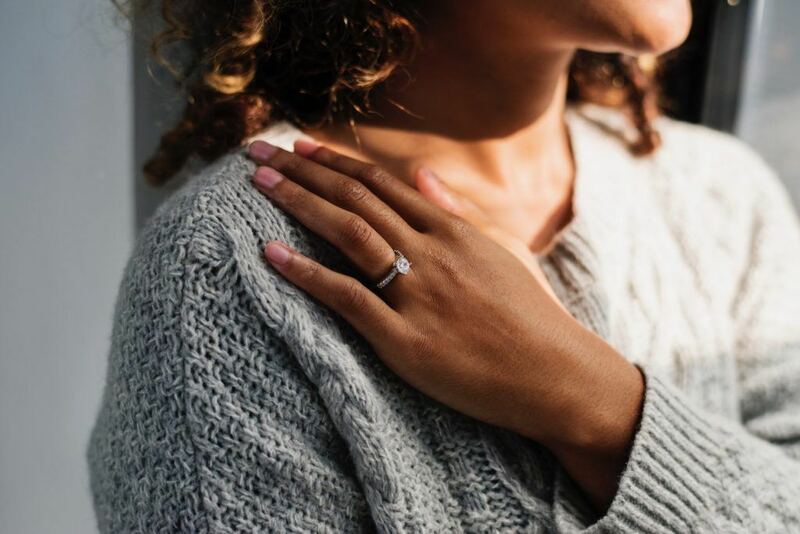 Since 1985, we have been part of the Falls Church community, connecting clients with the engagement rings and bridal sets of their dreams. Whether you choose one of our incredible designer ring styles or decide to create a custom design, you can be confident that you will walk out of our beautiful store with a ring you will love for years to come. Learn more about how you can make your jewelry dreams come true and create the engagement ring of a lifetime by contacting Dominion Jewelers today.